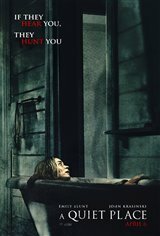 I thought it was a very good movie with excellent pacing considering it took place in a small area and making a sound usually means your dead. There were several well done scenes when the intensity was notched up to 11. (TIST ref) Just damn good film making. I watched It last week and I'm still thinking about it. It has this creepy effect to make you actually feel what's going on. Brilliant acting. Oscar ! Nice to have a horror actually deliver. Meaning, you get the rush you paid for. The premise was "sound", pun fully intended and you'll understand the pun once you see the show! Great pretense for the plot and it works. The element of forced silence becomes somewhat disturbing (and effective) as the movies progresses. As with any story based on sci-fi, there are a few spots where credibility disappears. Nevertheless, the acting carries the theme well. There's plenty to keep the viewer on the edge of the seat. Very good concept, much different than all other thriller and/or alien movies. Suspense from the beginning to the end with a sad ending however, acting was well done, plot and setting was nicely put together. A mix of the movie "signs" and "war of the world" which I don't think many viewers noticed. Definitely recommend watching on spare time to understand what is really going on. 5* rating, well done and looking forward to a sequel. Good till the last minute! Overall this was a good movie, my only problem with it is that it seemed to end right when it started to get good. Good premise but waaaaay over the top with bad luck. Movie had a lot potential. The movie had great potential but failed in realistic behavior of the characters involved. Unique story and concept, well acted, a different type of movie. I am thankful that my wife and I could enjoy this movie together and by the silence in the theater, everyone in the show also really enjoyed this entertaining story. You want real, stay home and watch a documentary or something. The big screen is a storytelling environment. A nice fun evening!!!! These movie was not trash because the dialogue. Wondering what would happen if this movie was made during the time was zero sounds in the movies? Lol. Complaining complaining. The sign language performance in this movie was incredible well done. Great movie. Wonderful movie. Great idea for a make-believe senario. As long as you remember that the aliens have no vision and hunt by sound, you'll enjoy the plot. Kudos to the young deaf actress and the wonderful job she did in teaching her co-actors sign language. This movie was trash. I couldn’t even feel bad for the characters with such little dialogue and connection. So predictable and doesn’t even deserve one star. Good money wasted. A good thriller. Movie was scary. No stupid. Movie was scary and I am 19 years old. I assume any reviews stating this movie was at all scary were age 40 and up. I am a huge thriller buff and this was predictable and boring. Didn't care about the family and why would you? Couldn't get into their characters, with the 1% dialogue an all. Felt the best part was the ending.....not because it was fun...because it ended. One of the best movies I've seen in quite a while. Jumped out of my seat a few times. Scary thriller, not blood and gore which makes it even better. I am sorry that you feel like that. I think that it was wonderful to. I'm 41, went with a girl friend, and we both were jumping in our seats! We both thought it was very well made, great acting, and scary enough to be an excellent thriller but not a horror (a genre I don't care for). I highly recommend it!